We all know how difficult it can be to keep up with the gym, especially when you’re always on the go. Moreover, it can be even more challenging when you have a demanding job. But if you are really serious about starting a daily workout, but have no time visit gym, then you need an effective alternative way to help you fit exercise into your schedule no matter how busy the life gets. 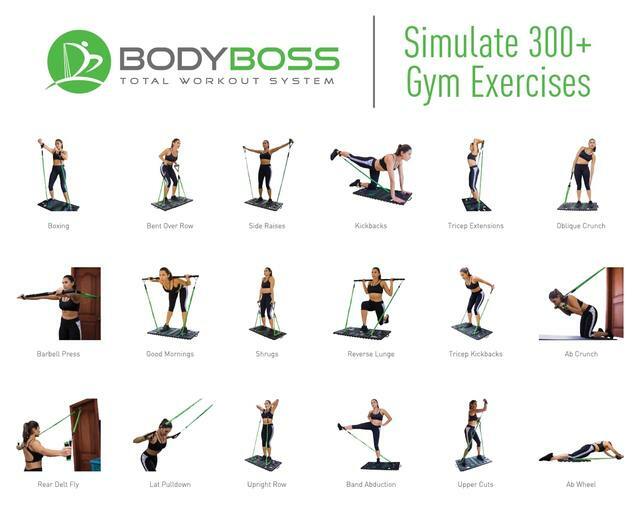 I am not sure if you have heard of BodyBoss Portable Gym 2.0, but you may be pleased to know that it may be able to solve your workout problem by bringing the gym to your home. 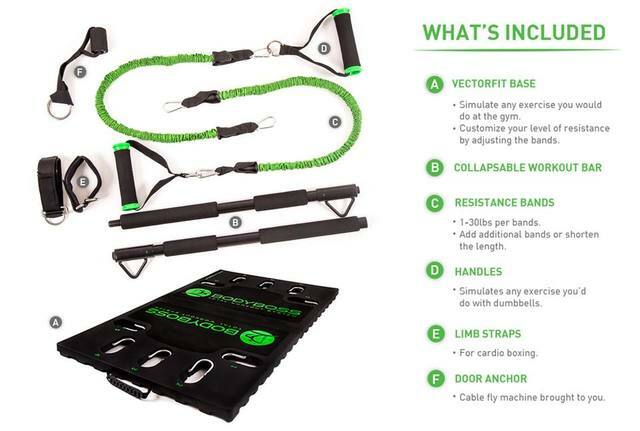 The company BodyBoss had just introduced their new line of portable gym kit version 2.0, which is a portable kit comprised of foldable VectorFit base, padded handles, high-quality resistance bands, door anchor, wrist/ankle straps, portable workout bar for squats, convenient accessory carry bag, and an instruction manual. 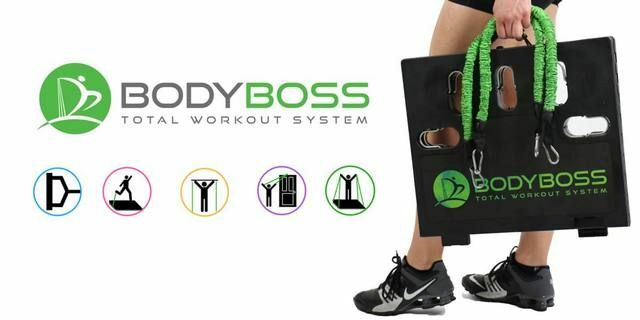 The BodyBoss system makes your workout fun and convenient experience whether you use it at home, office or during your travel! What's more? The kit does not even compromise on quality and results that you can achieve from the conventional gym-based exercise. Continue reading this BodyBoss Portable Gym review to find out about its design, benefits, how-to-use instructions and more! BodyBoss started as a small online business completely dedicated to creating products to help thousands of people every year achieve their fitness and a healthier lifestyle. Today, it is one of the leading health and fitness product on Amazon (bestseller with 4.7 out of 5-star rating) and one of the top-selling home workout products at Walmart.com. BodyBoss strives to design their solution to help everyone regardless of your weight, body type, age, gender or exercise styles and goals. Its sole purpose is to help people make their exercise and easy and enjoyable experience and achieve a healthier lifestyle. It always aims to keep innovating and bringing new and improved products to consumers that are not only long-lasting but excel in every standard. As the name suggests, BodyBoss portable gym brings the gym home while confining the complete equipment set into an accessory bag. This makes it easy to carry around and you won’t ever be without your gym, whenever and wherever you go. This accessory bag contains all the necessary equipment to build your own gym at home. The package comes with a vector base that can be folded to provide the ease of carrying around, padded wrist and ankle straps, padded handles, a door anchor, a padded portable workout bar and other accessories. These accessories can be used to perform more than 300 exercises that target multiple areas of your body to give you a whole-body workout. The instructional manual that comes with the package explains the various exercises that can be performed using the kit. You can also watch the online instructional videos that share a complete workout routine for thirty days. In addition, you can get a virtual guide for using the kit. This makes the BodyBoss portable gym an extremely easy and convenient experience. The BodyBoss portable gym has gained a lot of popularity in recent days and it is evident in the customer reviews you will see on their website, amazon.com or other marketplaces that sell BodyBoss Gym. If you are still unsure, keep reading further to know the top eight reasons why you should definitely give this product a try. BodyBoss is a complete workout solution to help you target every muscle in your body. It offers over 300 exercises to help you work out your shoulders, upper body & chest, lower back, quads, calves, abs, core, arms, biceps, triceps and more. With body boss you don’t need a whole lot of equipment, dumbbells or any other accessories besides this portable gym, saving you hundreds of dollars on the equipment or recurring gym fees. Most of us would love the idea of a personal gym, or better yet, a gym we can carry around with us. Not only is it comfortable, but it also gives you the freedom to new workouts; there are no restrictions. Moreover, it is the most effective and efficient solution if you cannot devote your time to the gym because of your busy job or if you travel a lot. In this BodyBoss 2.0 review, I have already mentioned that this kit gives you the advantage of setting up your own personal gym. So, if you’re someone who couldn’t adhere to the gym timings and always like to work out at the oddest hours of the day, so be it. BodyBoss home gym is the option for you. A portable gym is super light (weighs only 15 lbs.) and goes with you wherever you go. With today’s rapid lifestyle, it is always hard to keep up with daily workouts, especially if you’re not at home too often. 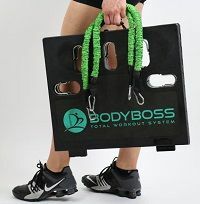 The BodyBoss gym is extremely flexible for carrying around as the whole kit fits into an accessory bag. BodyBoss made sure their product excelled every criterion such as portability. All the accessories, including the vector board, can be folded and placed in a small bag that is easy and comfortable to carry around. Even if you have a small living space, you won’t have to worry about the equipment taking up too much space. Moreover, it can fit into your suitcase when you travel. BodyBoss Portable Gym comes with-easy to-attach and rearranges accessories. Moreover, the company provides a handy instructional manual and online videos that gives you every essential information you need to know about the installation or use of the product. Also, there are hundreds of free online workout videos that you can follow while doing the workout. It makes it really easy to learn and practice new exercises. Think of it as your personal trainer! And there is always customer service to help you out should you need any help with the product and its how-to-use instructions. The BodyBoss is an international product inspiring thousands of people to get a healthier and balanced lifestyle. Currently, BodyBoss is a family of more than 40,000 people and you can connect with them through the online portals. It enables you to get inspired by their experience and share yours. Moreover, the online instructional videos train you on the complete workout routine. BodyBoss aims to expand their products all around the world. They have a fast and convenient worldwide shipping system and makes sure that the product reaches their global customers in its best condition. Doesn’t matter where you’re at, BodyBoss home gym will come to you. Once you hear about BodyBoss portable gym, the first question that may cross your mind – Can it replace my workout at the gym? It is a little hard to believe but it can completely replace your well-equipped gym. Now, before we jump into the details of the BodyBoss 2.0, we must remember that fitness has no shortcut and takes time, effort and persistence. With the BodyBoss gym kit, you get the equipment to perform all basic and advanced workout routines. The online instruction videos and the manual provided with the kit trains you to perform a four-week beginner course and get comfortable with the various exercises. Slowly, you can increase your intensity and resistance to get a more prominent workout. To increase the intensity of your workout, you can visit the online portal to see the workout routines of other members and trained professionals. Moreover, the instruction manual contains all the necessary details to help you increase your intensity level. But make sure you’re not overstressing your body when doing so. With constant work and simple cardio workout before the workout, you can see significant results in the first few weeks. All you need to do is be persistent and not give up on your goals. First and foremost, it is very important that you understand how to set up the BodyBoss gym. The gym kit comes with a detailed instruction manual to understand the step by step instruction of the kit. Moreover, you can find numerous how-to videos on YouTube to correctly set up your BodyBoss portable gym. To begin with, all you need to do to set up the BodyBoss vector base provided in the kit and attach the soft elastic cables to the extensions provided. For different exercises, you’ll have to rearrange the extensions to get the right pressure while exercising. The use of every extension is clearly explained in the instruction manual. Moreover, these cables can also be attached to solid vertical support like a door or wall to perform upper back exercises. Being a little redundant, let us bring your attention back to going through the manual carefully. It explains the safety measures you need to take while performing a few exercises. Moreover, never forget to warm up before you start with the BodyBoss home gym. You also get different types of handles to attach to the cables. This ensures you have the right equipment to perform the correct exercise. Starting with a light warm-up, here are six exercises to train different parts of your body. Starting from the top, the upright row is the best exercise to strengthen your shoulders and biceps. Position the cables at the outward extensions and settle your arms beside your hips. Holding this position for a second or two, pull the cables towards your chest. Perform three reps with ten seconds break in between. Moving onto your upper back and chest, the next exercise to help you strengthen your muscles is Rear Belt Fly. For this, attach the cables to a vertical support, probably a door, using the padded door anchors. Attach the cables and simultaneously stretch your arms wide. This will put pressure on your chest and upper back helping you strengthen your muscles. The single leg deadlift is an amazing exercise to work on the lower back muscles and lats. All you need to do is attach the cables correctly, as shown in the instruction manual, and use them to support your body on a single leg. Make sure your posture is correct. The good old squats! We all know squats are one of the best exercises to get your thighs and hip in shape. Use the crossbar and attach it to the vector board with the help of cables to perform the exercise. This will put a little pressure when you rise and thus increase your muscle strength. Using the same bar, perform the ab twist. Hold the bar high above your head and spread your feet shoulder length apart. When in position, twist as much as you can to one side and hold for a few seconds to experience pressure. Repeat on the other side. This is perfect to strengthen your abs and abdominal area. By following the exercise manual, correctly align the cables with your body. With the help of these cables, stretch your hands as high above your head as possible, before bringing them back down. Perform three repetitions of triceps extension to notice significant results. What are Pros And Cons of BodyBoss? ● It is easy to use and set up. Its compact size makes it very easy to carry around and transfer from place to place. ● Since it is extremely lightweight, it can easily fit into travel cases and can be taken to hotels. As mentioned, its small size makes it easier to exercise anywhere as it doesn’t require any external support. ● The kit comes with a detailed instruction manual to set up the kit and perform basic workouts. ● The online tutorials can help you increase the intensity of your workout. ● It is a little pricey when compared to similar products. Though the company offers a lifetime warranty and constant customer service, it is a little difficult to spend this sum of money. ● There is a paucity of an online tutorial on this product; especially considering the fact that it’s got so many users. The company has a very detailed instruction manual but sometimes it is easier to understand the concept visually rather than theoretically. ● There are no high resistant bands available. To increase the intensity of your workout, you can change the position of your cables but there are no high resistant cables to switch the old ones with. So, it may be a problem if you are looking to boost the strength training aspect of your workout. BodyBoss, as already mentioned, doesn’t have a complex structure and can be used even by beginners. With such basic accessories, it is also safe as the company ensured there is no hard equipment. Since the product is used without a professional guide, here are a few measures that will ensure your safety. BodyBoss provides a detailed and well-informed instruction manual with the kit. This manual contains all the necessary details to correctly use the equipment. Make sure you’re using the right equipment for the right purpose. Exercising is a very active way to keep yourself healthy, but there is always a right way to do it. BodyBoss has several how-to videos on YouTube that tell you about the correct procedure to perform a certain procedure. Always follow the right procedure to prevent yourself from getting hurt. Exercising can be liberating when you get into it. 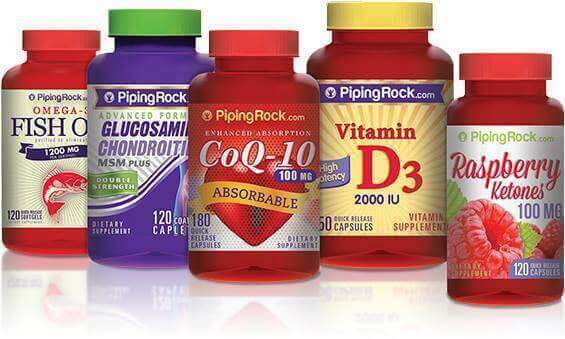 Many times, people make the mistake of overdoing it which stresses their muscles and causes unwanted damage. Therefore, it is extremely important that you follow the routine and not stress too much. BodyBoss offers flexible and strong equipment that can last for years. But when asked about an exact number for durability, the only answer you can find is that it depends on the usage. Almost every part of the kit lasts a long time without any degradation in quality. The only thing that needs timely replacement are the resistance chords. But here's the good news for the BodyBoss lovers. The company provides a warranty on almost every product and you can easily replace the old chords with the new ones at a much economical price. In this BodyBoss 2.0 review, we went through various advantages and disadvantages of the product. Now let’s see how you can save your money on BodyBoss and make your purchase even more exciting. Here are a few methods you can get a discount on your BodyBoss portable gym. Get 15% Off your entire order at Bodybossportablegym.com. Use Promo code "SAVE15" at Checkout. You can also sign-up for their monthly or weekly newsletters. You will not only receive tips to get the best out of your BodyBoss system but also receive with occasional coupons with great discounts. We definitely recommend you subscribe to their newsletter and keep an eye open for any coupons or special offers. If you really want to save some money on your BodyBoss portable gym kit, keep on visiting their website frequently. When you add your product to the cart they are likely to give you a great discount if you order within a certain time limit. Moreover, this will keep you up-to-date on any ongoing sales. BodyBoss has partnered with several online payment portals. You may qualify for a great discount or cash back if you choose a certain payment method. Just make sure you have a few options available for purchasing the product. Q. Does BodyBoss portable gym guarantees results? A. Results vary from person to person depending upon how much effort they put into their routines and how does their body react to it. Usually, the person starts seeing significant results within 12 weeks of training. Q. Is there a trial version available before I decide to purchase the product? A. Unfortunately, there is no trial version for the BodyBoss portable gym kit. But you can avail a free seven-day trial for the BodyBoss workout manual and see if that does you any good. Q. How Do I know if I am fit to use the BodyBoss portable gym kit? A. It is designed for everyone, from beginners to advanced trainers. So, you won’t have to worry about being fit to use this portable gym. BodyBoss has helped many people achieve a fitter and healthier lifestyle. They understand that the gym is not the place for everybody and that’s why they, have bought themselves the perfect solution. The BodyBoss portable gym comes with all the equipment that you would need to perform your daily workout. Moreover, with the help of online instructional videos it becomes extremely easy to perform the exercises. So, get on with your workout today, without any commitments.